Have you tried everything but you still aren’t getting the leads and sales from your Facebook marketing? Have you spent a fortune on facebook ads that don’t work? Or if you are just getting your business off the ground and want to attract the right customers from the start, this book is for you. Attract customers Now From Facebook is for Enlightened Entrepreneurs looking to attract conscious customers now. Discover how to attract Likes, leads, and customers for your business so that you have more time, money, and freedom in your life. WHAT AN AMAZING EDUCATION! I learned more in the first few chapters of this training about Facebook marketing than I have in years of newsletters, other books and talking to people! In fact I just had a session with an experienced web marketer earlier this week and Bret’s direct and thoroughly digestible chapters not only showed me how that marketer’s counsel could not help me but also clarified, for me, what he told me that could help.I’ve had several failed attempts at expansion through FB and failed each time. I can now see EXACTLY why those failed and how I will systematically work through to completion. A delightful, must read book on Facebook marketing What a delightful book. If youâve ever struggled with the Facebook marketing stuff, then this is a must read. 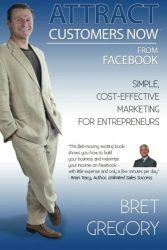 It covers everything you need to know (to get started), and to do it right.Bret takes you by the hand and shows you EVERY, even tiny step to any aspect of FB marketing, list building, or growing your business on FB. What I found highly useful was the rich use of pictures and illustrations such as the exact sections of FB pages, or images to compare to each other. In that sense, itâs rather a workbook, which adds even more value to this excellent book.